Becoming a Bar or Bat Mitzvah is one of the most significant events in a child’s Jewish upbringing. It celebrates, at age 13, the child’s readiness to take on the blessings and responsibilities of a Jewish adult. In some cases, a person may become a Bar or Bat Mitzvah as an adult. Parents can expect to receive a Date Selection Letter in the mail during the fall of their student’s 4th grade year. (Depending on birthdays, there is a possibility your family won’t receive this letter until the 5th grade year or will receive it as early as the 3rd grade year.) This letter will direct you on how to submit your preferences for a Bar/Bat Mitzvah service date. If you join Shaare Emeth when your child is in 4th-7th grades, please contact Cantor Seth Warner to discuss setting up a B’nei Mitzvah date, 314-569-0010. B’nei Mitzvah candidates usually begin their formal study path in preparation for becoming a Bar or Bat Mitzvah during their 6th grade year. However, depending on birthdays, your student may be in 5th or 7th grade. In order to become Bar or Bat Mitzvah at Congregation Shaare Emeth, each student must have been enrolled in and attended Shaare Emeth’s Religious School or an approved equivalent for at least four years. B’nei Mitzvah fees must also be paid, a pay plan in progress, or other financial arrangements made with Cantor Warner. Please call Cantor Warner if you need to discuss scholarships, 314-569-0010. The Congregation Shaare Emeth B’nei Mitzvah Program is built upon the above three pillars: Torah, Worship, and Acts of Loving Kindness. Our requirements for each B’nei Mitzvah student are based on fulfilling goals in each of these three areas. Each student will receive one-on-one study with the cantor and another Hebrew teacher as well as work in small groups of peers to prepare for leading the service and chanting from the Torah and Haftarah. Students will work closely with one of the rabbis to outline their interpretation of their Torah and Haftarah portions, to write introductions for both, and to outline and write their D’var Torah, a teaching on their Torah portion. Students will also work with our director of Jewish life and learning on choosing, planning and implementing a Project Chesed, a B’nei Mitzvah project. The B’nei Mitzvah process and requirements are described in detail in the B’nei Mitzvah Family Guide, downloadable from the resources subheading on this page. The 6th grade study year begins with two to three required parent and student meetings, the first in the fall and the second in the winter (a third is held only if necessary). The 6th Grade Parent B’nei Mitzvah Meeting explains the B’nei Mitzvah process. 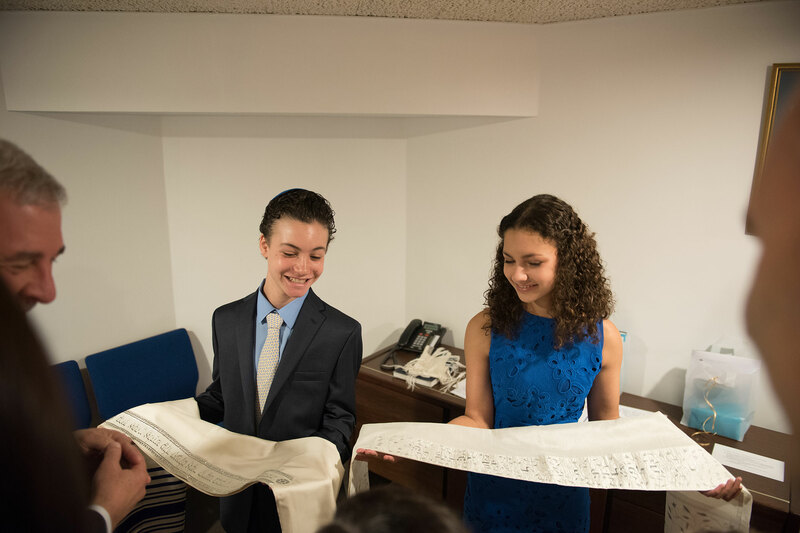 The B’nei Mitzvah Experience invites students and parents to participate in a unique service, listen to one-of-a-kind teachings by one or more clergy members, participate in special activities, and receive their Torah portion and B’nei Mitzvah Family Guide. Students will begin studying in preparation for their Bar or Bat Mitzvah 6 to 8 months before their scheduled date. The B’nei Mitzvah assistant will contact your family by email to setup the first appointment (for at least one parent and the student) and weekly lessons (student only). The assistant will also describe the process for all other appointments and give you the time of your Final Rehearsal, typically held the Tuesday before the B’nei Mitzvah date at 4 or 5 p.m.
Every year (or two), Shaare Emeth offers an adult B’nai Mitzvah class. During this year-long course, adult students learn Hebrew reading and chanting skills and explore Jewish thought and prayer. The class meets weekly and shares a B’nei Mitzvah ceremony in May. The class is usually 5–15 students; some were raised as Jews but never had a B’nei Mitzvah and others have chosen Judaism as adults. Ability to read Hebrew is a prerequisite for participation in the Adult B’nei Mitzvah class, which can be fulfilled in our regular Adult Hebrew course. Please contact Cantor Warner, 314-569-0010, for additional information.